The Satanic Church and The Beliefs behind it (Full Documentary). Episode 221 is with Curtis Duncan, pt. 2, titled: “Homosexuality and the Chemical Manipulation of Humanity”. This episode is being released on Wednesday, December 31, 2014, and was recorded on December 29. Curtis Duncan is a holistic health and weight loss experts. He has spent close to a 12 years doing his own independent research on health and wellness. His areas of expertise include holistic health, the Emotional Freedom Technique, self-love and esteem, Vitamin D and the benefits of sunlight exposure, nutrition, the dangers of environmental chemicals and GMOs, natural remedies, weight loss, the dangers of stress, women’s and men’s health, preventing and curing disease, the dangers of Western Medicine and pharmaceuticals, sexuality, sexual health, and food and health conspiracies. He has a deep understanding of the politics and business of obesity and “disease”, how our predatory economic system makes people sick, the dangers of pharmaceutical drugs and conventional medical treatments, and the fraudulent global Medical Monopoly and their conspiracy to make humanity sick and so they can make endless profits at individual’s and society’s expense. In this episode Curtis Duncan discusses how a group of chemicals known as endocrine disrupters are literally bringing about the destruction of humanity. These ubiquitous chemicals, which are found in a host of products from plastics, condoms, food, and cosmetics are changing human DNA and turning humanity into diseased mutants for the profit and benefit of Big Pharma. Even worse, these chemicals cause numerous diseases and conditions from prostate cancer, fibroids, diabetes, ADHD, bipolar disorder, breast cancer, heart disease, birth defects, early puberty, PCOS, impotence, undescended testicles, and obesity. Furthermore, these chemicals are changing people’s sexual orientation and gender identity in the womb thus making individuals gay. This is for the benefit of the population control eugenicists who wish to increase homosexuality to decrease the world’s population. In particular, they wish to decrease the population of certain ethnic groups. He’ll also discuss how to protect yourself and your family from these chemicals, how to avoid them, how to remove them from your bodies, and simple tips to fight their dangerous and deadly effects. The Whole Soy Story – by Dr. Kaayla Daniels, PhD. UPDATE: As it seems, and as I suggest in the video, the plans of the New World Order as laid out on the Guide Stones have indeed started. The first ‘commandment’ on the stone slabs is to keep humanity under 500,000,000. This requires massive depopulation. 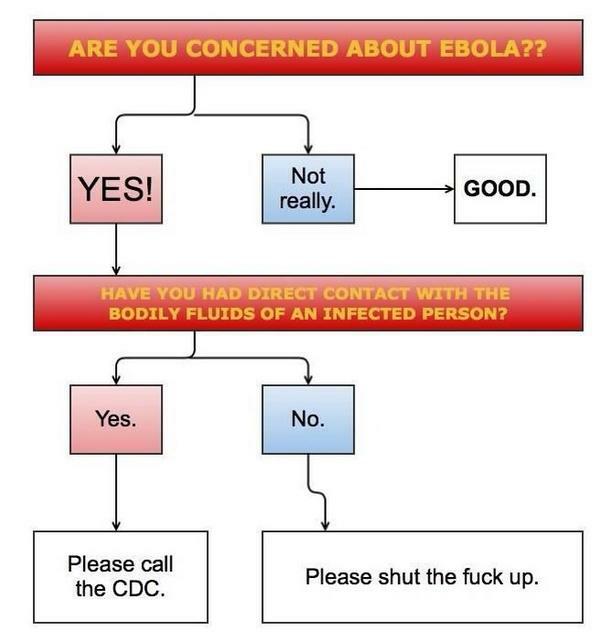 Ebola is an effective tool in this and has now come to the US. DOCUMENTARY — The Age of Transitions – TransDehumanism 2013-2020 – NWO Agenda Defined! Many people around the world are targeted for their political views and tortured via technotronic means via their computer, their phones and even via their house’s electric wiring. This can be enhanced by satellite and triangulated by mobile phone towers. With the aerial spraying campaigns of smart dust for the last twenty years, are we now senders and receivers of information, walking antennae? Alex’s story is shocking and at times deeply disturbing listening though for all he and his family have been through he has kept his unique sense of humour and indomitable spirit. A truly Canadian hero who has sacrificed so much in bringing this important information to the public. Alex says: I lost a couple of months’ work this summer due to an extremely bizarre, persistent and blatantly synthetic ‘pneumonia’ triggered and exacerbated by the tyrannical and genocidal globalists’ aerosol – electromagnetic – technetronic – chemical, biological, advanced biological and genetic and nano bio polymer warfare. I am an artist, activist and investigative reporter. It has become very obvious to those of us that do what I do that the aerial, land and naval aerosol – electromagnetic spraying program and the communications technology and infrastructure we were sold under the guise of our convenience and protection is actually population reduction and control. This advanced, withheld and weaponised technology gives the ruthless ruling group the ability to select who lives and dies, who gets tortured, sleep deprived, irradiated, microwaved, mentally and physically mutilated with psychotronic frequencies, incapacitated and assassinated as explained in the literature accompanying my artwork/photo posts on Facebook, the videos I posted on YouTube and the radio shows I have done as recently as this afternoon. Most regrettably World War III is upon us. Try to keep the children as safe as can be under the circumstances. 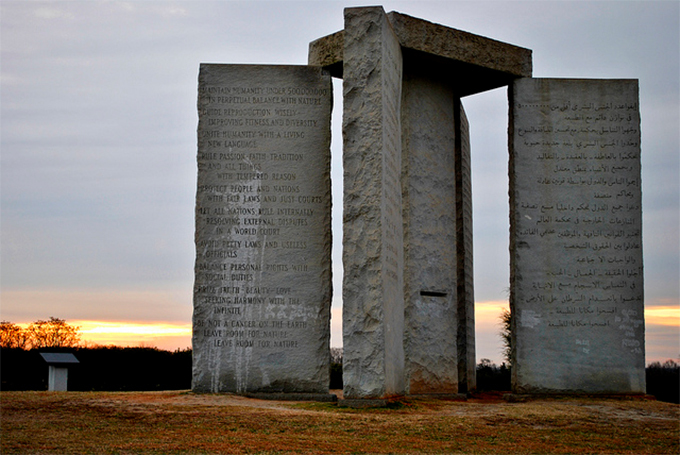 The elite’s cryptic monument to depopulation and world government just became more mysterious (and creepier) – somebody has officially updated it with an engraved cube marking the year 2014 inserted into the English/Spanish slab of the ’new 10 commandments’ for the ’Age of Reason’ desired by its creators. 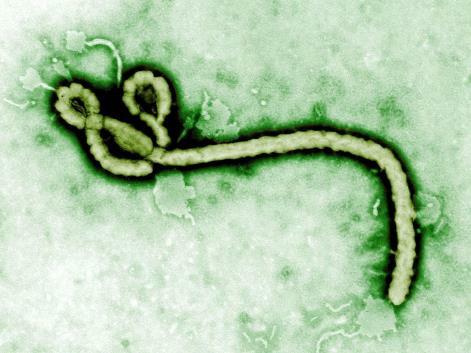 There is currently no licensed or authorized treatment or vaccine for Ebola virus. Serum containing antibodies from previously infected survivors of Ebola disease was used to successfully treat seven out of eight patients in the 1995 Congo outbreak (although those results have been disputed repeatedly), and other experimental treatments are currently being developed including monoclonal antibodies and prototype vaccines. Controversy has arisen in the current outbreak over the unauthorized use of an experimental treament (“Zmapp“) to treat two cases in the US (see below). 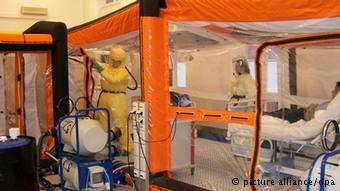 On March 22 2014, an epidemic emergency is declared after an outbreak of Ebola haemorrhagic fever in southern Guinea. That day, Médecins Sans Frontières announces they have already deployed 24 nurses, doctors, logisticians and hygiene and sanitation experts to the country with 33 tons of supplies leaving France and Belgium on the way. On March 31st, Ebola is confirmed to have spread to Liberia where two sisters (one of whom has just returned from Guinea) are found to be carrying the disease. The death toll rises to 78 people. In early April West Africa begins mobilizing to combat the spread of the disease, including sending health teams to border territories. 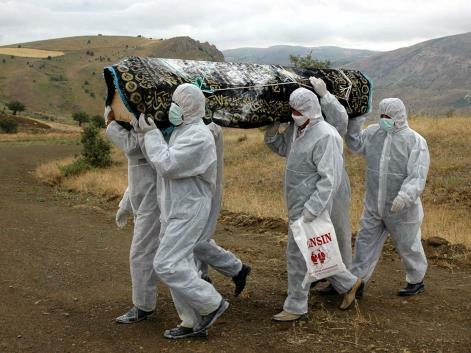 By May 27th the death toll rises to 187 and the virus is confirmed to have spread to Sierra Leone. 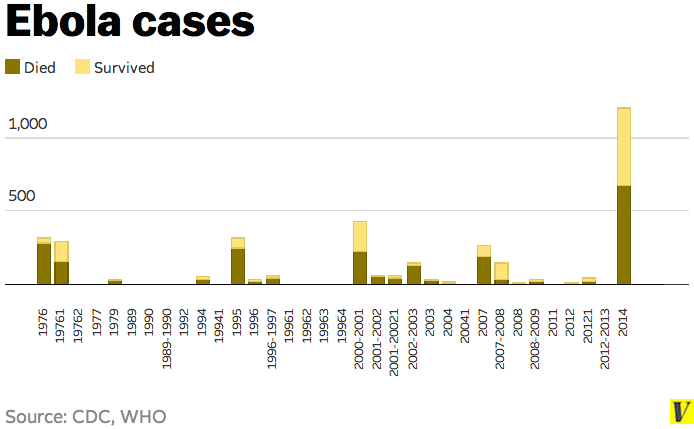 By mid-June, WHO data shows 333 total deaths, making this the deadliest outbreak in recorded history. The previous most deadly outbreak was the 1976 outbreak in Congo, with 280 reported deaths. On July 3rd and 4th the WHO convenes a two-day Emergency Ministerial meeting on Ebola Virus Disease in Ghana where West African countries and various international organizations agree to adopt a strategy of “cross-border collaboration” for combating the outbreak. They also decide that the “WHO will establish a Sub-Regional Control Center in Guinea to act as a coordinating platform to consolidate technical support to West African countries by all major partners; and assist in resource mobilization” and that the WHO will be a lead organization in coordinating action on the issue. Convene national inter-sectoral meetings involving key government ministries, national technical committees and other stakeholders to map out a plan for immediate implementation of the strategy. Deploy additional national human resources with the relevant qualifications to key hot spots. On July 25th the WHO confirms a probable case of Ebola in Nigeria, although an undated post on the Nigerian Federal Ministry of Health website claims to “debunk” Ebola in Nigeria, claiming that it is in fact Dengue Fever. On August 2nd, an infected American aid worker traveled from Liberia to the United States to receive treatment at Emory University Hospital in Atlanta. According to Reuters: “The facility at Emory, set up with the U.S. Centers for Disease Control and Prevention, is one of only four in the country with the facilities to deal with such cases.” A second American aid worker, also infected in Liberia, arrived at the same facility two days later. As of August 6th, the disease is confirmed to be spreading in Guinea, Sierra Leone, Liberia and Nigeria. Suspected cases are currently being tested in Lagos, the Philippines, and Saudi Arabia. The total number of confirmed cases stands at 1,711 with 932 deaths. An emergency meeting of “global health experts” has just been convened by the WHO in Geneva to address the situation.UPDATE: On August 8th, the WHO declared the current Ebola outbreak a “Public Health Emergency of International Concern” This is an instrument under the International Health Regulations, a legally-binding international agreement on disease prevention and control. The declaration allows for potential international coordination of the crisis and grants the WHO powers to obtain and share information about the crisis anywhere within the IHR territories with or without the consent of the individual governments involved. According to Stephen Morrison, the director of the Global Health Policy Center at the Center for Strategic and International Studies, this potentially allows for “boots-on-the-ground” intervention by the US military or other NATO member countries to operate in these environments in terms of ground transport, supply chain, and distribution of commodities. This is only the third time a PHEIC has been declared, the first being the 2009 swine flu outbreak and the second a declaration related to polio earlier this year. According to Bloomberg: “Despite the deadly nature of the disease, the relative rarity of outbreaks and their confinement to primarily rural areas of poor African nations make Ebola an unattractive target for big drugmakers.” An American or German outbreak, would, of course, change that calculus, and just last month a potential treatment for the disease was put on hold by the FDA due to safety concerns. Now, controversy is arising after experimental medicine was given to the two stricken American aid workers without FDA approval. The BBC describes the medicine as a “ZMapp drug, which has only been tested on monkeys.” For many, the idea that the WHO is heavily involved in a pandemic emergency in which drug companies are looking to circumvent traditional approval processes raises eerie parallels with the 2009 swine flu scare, which followed this pattern almost exactly, and was later ruled by both the British Medical Journal and the Council of Europe to have been a sham pandemic declared by a Big Pharma-connected WHO panel on behalf of the vaccine manufacturers themselves. This is in line with similar statements by fellow biologists, including Dr. Eric Pianka at the University of Texas at Austin, who eyewitnesses claim used his acceptance speech for the 2006 Distinguished Texas Scientist Award from the Texas Academy of Science to muse on “the elimination of 90 percent of the human population” through an airborne disease like the Ebola virus. Some have pointed to the long, documented history of government research into biological weapons and intentional government releases of biological agents on their own citizens in the past as a sign that the current outbreak could be some form of intentional bioweapon release by a government agency or rogue actor. Yet others argue whether the current outbreak is being deliberately downplayed to hide the severity of what is happening or deliberately overhyped to panic the public and make them acquiesce to medical martial law or other dramatic maneuvers. Some even question whether or not the entire pandemic is a hoax.